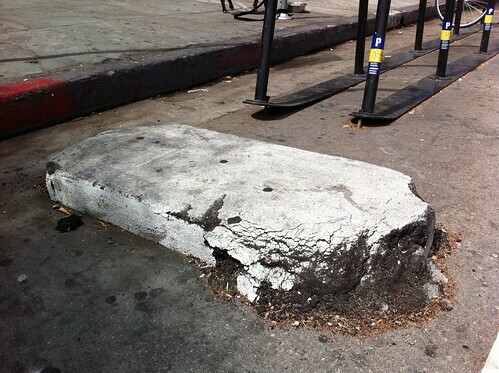 Back in August, someone accidentally backed into our bike corral at the intersection of York Blvd and Ave. 50. The corral sustained some damage to the concrete island and the rack frame. Fast forward to November, and we are happy to report that City crews have recently re-bent and re-bolted down the steel track, restoring all of the corral’s spaces to perfect working order. We have also recently submitted work orders for a new improvement to the corral’s design. More on that below the fold. The York Blvd. bike corral is the City of Los Angeles’s first ever bike corral. It was authorized last year as a “Pilot Program” by the City Council and has thus far been a valuable learning experience for the Department. Incidents such as these allow us to address flaws with our original corral design before we begin citywide implementation of the program. To address future incidents, we have recently submitted a work order to add a new sign and post to be placed on the eastern raised buffer that separates the corral from motor vehicle parking. We hope that this improvement will make the corral more visible so that future back up incidents do not occur. 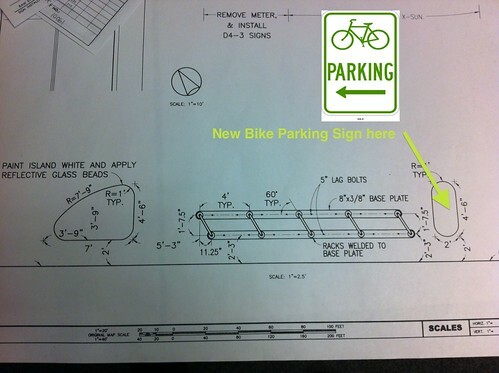 We are also re-evaluating our bike corral designs per lessons learned from our own corral and from other cities. We’ll be sure to update you here on the blog when the new sign is installed. To get the bikes closer together, every other bike has it’s wheel elevated more than the bike next to it, in order to reduce the space required by the handlebars.. It also creates a smaller footprint for the bike parking by elevating the front wheels. I’m sure it’s much more expensive than the San Luis Obispo design, but it also includes an easier way to lock the bike and it’s much more pleasing to the eye, maybe even artistic.